That’s why several players and their financial advisors rely on CLA Realty to help them find the perfect Arizona home with as little inconvenience as possible and a huge emphasis on protecting their privacy. We may be one of their biggest fans, but we can assure you that when we work together, it’s strictly business. Because of the nature of the business, we handle all the details along with their financial advisors and keep it simple for the players. If necessary, we can coordinate sending paperwork via Federal Express to wherever they might be playing, even if they are on the road. Whatever it takes, I get the job done. Quickly, professionally, discreetly. 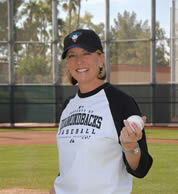 I’ve successfully helped many professional athletes buy and sell homes in Arizona. Of course, we can’t and would never reveal their names, but we can share some of the teams whom these players have been associated with, including the Arizona Diamondbacks, Milwaukee Brewers, Tampa Bay Devil Rays, Oakland Raiders, Chicago Cubs and Pittsburgh Pirates. If you’re looking for a professional, experienced, reliable and discreet Realtor to represent you or your professional athlete client, please contact us. It will be the best move you’ve made today!